It’s the value that is added to a client’s financial plan by optimizing sound tax strategies. Why an EA is important? Comprehensive services ranging from Tax & Accounting to Investments to Home and Auto Insurance. Our Enrolled Agents can help provide effective tax preparation and strategies to make your life less taxing. Where will your retirement money come from? A sound approach involves closely looking at potential retirement- income sources. Our Independent Insurance Agents can provide you with a sound insurance program that covers everything from Home and Auto to Life Insurance. 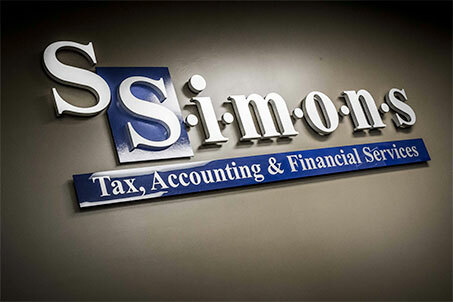 Welcome, we’re Simons, a full Service Financial Services Firm in Hays, KS. We understand that individuals face unique challenges when it comes to choosing a firm to work with. We offer a holistic approach by addressing people’s needs for financial services from every aspect. No one has more experience, education, licenses and accreditations than we do. We are a team of multiple licensed and experienced professionals of Enrolled Agents, Insurance Agents, Tax Specialists, and have one of the few CFP’s within Kansas. With our holistic approach, we will evaluate your needs and offer you solutions that best fit those needs. Whether your goal is preparing for your retirement, saving taxes, or shopping for home and auto insurance, we can offer a comprehensive plan that is specifically for you. Our professionals have years of experience in tax, financial and insurance services. We can help you address your needs of today and for many years to come. We look forward to working with you through all stages of your life.